In the coastal areas ravaged by the 2011 Tohoku earthquake and tsunami, current consensus-building between the government-driven construction of giant seawalls and local residents calling for a review of these plans has become bogged down. This seawall issue is concerning massive public works projects into which about one trillion yen of taxes will be pumped, but it is also about the future shape of the coastline of a large portion of Japan, since the improvement policy will become the model of a countermeasure to a Nankai Trough earthquake. Viewed from these aspects, the problem goes beyond the disaster-stricken areas. Furthermore, considering this seawall issue also provides another major issue that needs to be addressed by post-disaster Japanese society. The problem stems from the Japanese government’s very broad post-disaster classification of tsunami into two sizes, „frequent tsunamis,“ commonly called level 1 (L1) tsunamis, which occur roughly once every several decades to one hundred years plus several decades, and „maximum class tsunamis“ like the one in 2011, commonly called level 2 (L2) tsunamis, which occur about once every one thousand years, and its notification to local governments on how to set the height of their seawalls to deal with L1 tsunamis. 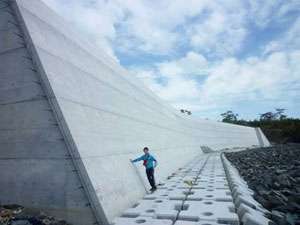 Nevertheless, the planned seawall to defend against L1 tsunamis at Kesennuma in Miyagi Prefecture is a gigantic concrete wall with a maximum height of about 15 meters and a width of around 100 meters, extending several hundreds of meters along the seashore (Nakajima coast in Koizumi District.) As the plan became known, some residents, researchers and supporters have begun to voice a range of worries and concerns, such as its adverse effect on tourism and inshore fishing, reduced disaster awareness due to being unable to see the ocean, a decline in seaside lifestyle and culture, and its negative impact on the ecosystem. Having listened to these voices, the government is making changes such as lowering the height in some places where they decide there are no assets behind the seawall that should be protected. But opinions on what should be protected vary even among fellow residents depending on where they live, how they make a living, and so on. Also, creating a pleasant community where people will want to live and visit in the future requires an overall perspective of what kind of town to build, including the use of land behind the seawall. In this way, solutions to the seawall issue should address both urban planning and the future of local communities. Local residents would, under normal circumstances, discuss the future of their town thoroughly and decide the location, height, shape, and the like of a seawall taking into account the opinions of experts, neighboring communities, and other parties concerned. Not only is it the wrong way round for the government to unilaterally draw up blueprints for a seawall and then ask residents for their consent, it is also likely to harm personal relationships in the earthquake-hit region by creating intra-community conflict between supporters and opponents of the plan. If we consider the direct damage caused by an earthquake as a „primary disaster,“ we can call the above difficulties facing residents in a planned region a „secondary disaster“ created by the process of recovery and restoration work. Behind this, we can see two very modern politico-economic ideologies, one-dimensional economism which disregards the real circumstances of communities and believes that prioritizing development leads to human happiness, and centralism which emphasizes top-down decision-making. There is no doubt that, since World War Two, Japan has pursued economic growth while aiming for both a market economy founded on the principle of freedom and a welfare policy founded on the principle of equality, from which we have all reaped many benefits. The flip side of this is our social vulnerability, which has been exposed by the destruction of regional communities and the natural environment and especially when large-scale natural disasters have hit urban areas. Today, out of regret for this, volunteers guided by the principle of solidarity and mutually supportive local communities are expected to supplement the limitations of our government and the market. Looking at this historical course, it is easy to predict that seawall plans led either by a national government or a quake-hit local municipality with limited public finances will eventually become difficult to sustain and place an excessive burden on communities. To resolve the seawall issue, therefore, it is important to create a forum led by residents and incorporating concerned parties to discuss, even at this late stage, a comprehensive future regional vision including seawalls. 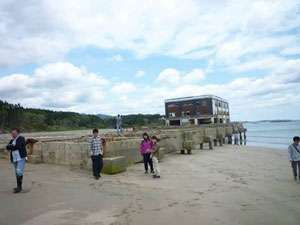 In fact, the Maehama District of Motoyoshi-cho, Kesennuma, an area buzzing with community activities since before the tsunami, decided at the end of this July to set up its own tsunami defense plan independently from government proposals. Regarding the law, too, a revision of the Coast Act in June of this year has permitted the establishment of a committee to discuss coastal disaster prevention and mitigation measures if deemed necessary by the state minister in charge and prefectural governors. To strengthen national resilience, it is important before we build concrete walls to cultivate regional personal relations that will enable a more flexible response to disasters. If the new Abe cabinet inaugurated in September positions earthquake reconstruction and regional revitalization as priority issues for Japan, they should give positive consideration to setting up such a committee.